The Philosophy of Kitchen Alchemy is to cook with the seasons. Utilizing ingredients the are farmed locally and are organically grown. Cream together the butter and sugar until smooth. Add in the eggs, one at a time,and beat until fully blended. Add milk and vanilla and mix until combined. In a separate bowl, combine flour,salt and baking powder. Beat the dry ingredients into the wet ingredients, and beat until creamy. Do not over mix. Spread into a greased 9’’x13’’ cake pan and bake at 350 for 30 minutes. 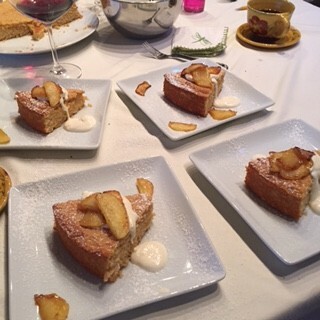 Serve with caramelized apples and vanilla whipped cream. Caramelized Apples – Peel and core honey crisp, gala, or apple of choice and cut into 1/4 inch slices. Heat nonstick pan to medium-low. Add a pad of butter and natural cane sugar to pan. Lay the apples in a single layer. Let apples turn a golden brown. 4-5 minutes on each side. Vanilla Whipped creme – Use stainless steel bowl and put in refrigerator to keep cold. Pour 8 ounces of whipping creme 1/2 teaspoon of confectioners sugar and 1/2 teaspoon of pure vanilla extract. Whip at medium to high speed if using kitchen aid or other mixer, until softly whipped.